The study presents the results both for the D/A/CH and Benelux market as a whole but also for each individual country. Within the individual product groups, there is also a distinction between the domains of Living and Contract. This means that trends and structural changes in the market can be identified on the whole and in detail. 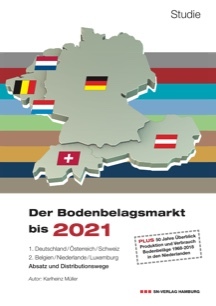 Studie "Der Bodenbelagsmarkt in 1.Deutschland/Österreich/Schweiz 2. Belgien/Niederlande/Luxemburg bis 2020. Absatz und Distributionswege"
Published in April 2019 in German language.